I seriously think this is the best thing I have ever done. My goal was to create the most awesome image I possibly could, and I really wanted to kinda mirror the damascus pattern a little bit in the scrim itself. Mission totally accomplished. I'm so excited. :-) The knife is going back to the maker, and he will have it at Blade Show in Atlanta at the end of the month. 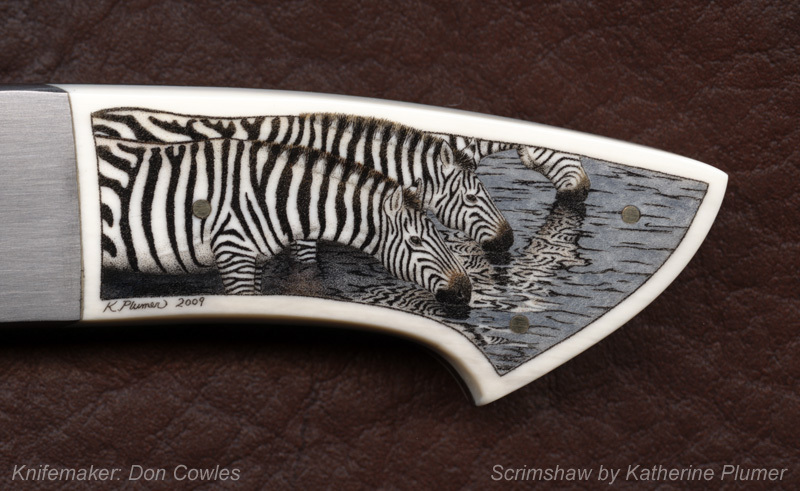 So if you're going to Blade Show, find Don Cowles and check out this knife!!! ps- full color scrimshaw is really hard. I don't know what else to say, but my gosh - it really may be my favorite (out of all of your work). It's an amazing piece! Holy macaroni! You have not been doing scrimshaw as long as your other art, but you are so good at it! Holy macaroni with CHEESE! Watching the work in progress, I never imagined it would end up with this degree of almost photo-realism. A-f'ing-mazing!! Artist wife agrees.